I get angry every time I read a newspaper headline or see a TV news feature that shouts about an “end to paralysis” and a “miraculous recovery of the ability to walk!” It’s not that the information in the stories is incorrect, but that the attention-grabbing headlines are misleading and raise false hopes. Since many people only scan newspaper headlines or half-listen to TV news stories, they mistakenly believe that a “cure” for paralysis is close at hand, even if that isn’t what the story says. Well-meaning friends and relatives use social media to pass on these news stories and videos to people who are living with paralysis. They hope the “great news” will cheer them up. It never does. Case in point: a recent article in yesterday’s Washington Post was immediately posted and re-posted all over social media. It featured news of an experimental therapy that implanted an electrical stimulator in the spinal cords of paralyzed patients. 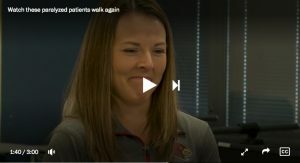 After months of daily physical therapy, one patient was able to stand and take limited steps and two others were able to walk on their own. It was “not like flipping a switch.” The subjects all had months of intense physical therapy both before and after the surgical implant. They had to retrain their brains in order to learn to walk. There are still a many unanswered scientific and medical questions about how this technique works. See the video of individuals who took part in the Universtiy of Louisville Study – from the Washington Post here. The research is important because it may represent what scientists call a “proof of concept.” It shows that an electrical stimulator implanted in the spinal cord of a paralyzed patient can result in the recovery of voluntary control over leg movements. That may turn out to be a big deal some day. But, for now, it’s a long way from “paralyzed people beginning to walk”. The walking folks were also incomplete injuries. Here, Here, Thea. Research is important but we need to put this into context. Scientific discovery is important but a rush to media headlines is troubling and draws speculation. A wonderful story that can help me more and more. Such an informative information you share that help me remove my sorrow.